Hello, all! At the time of this post going up, I will be on a cruise to Bermuda! Yay! Before leaving home, I created some cards to give to crew on the ship with monetary tips inside (it’s customary to tip the crew member in charge of your room). So today’s video shows the creation of the cards. I decided to create three watercolor backgrounds using different watercolor methods and techniques. 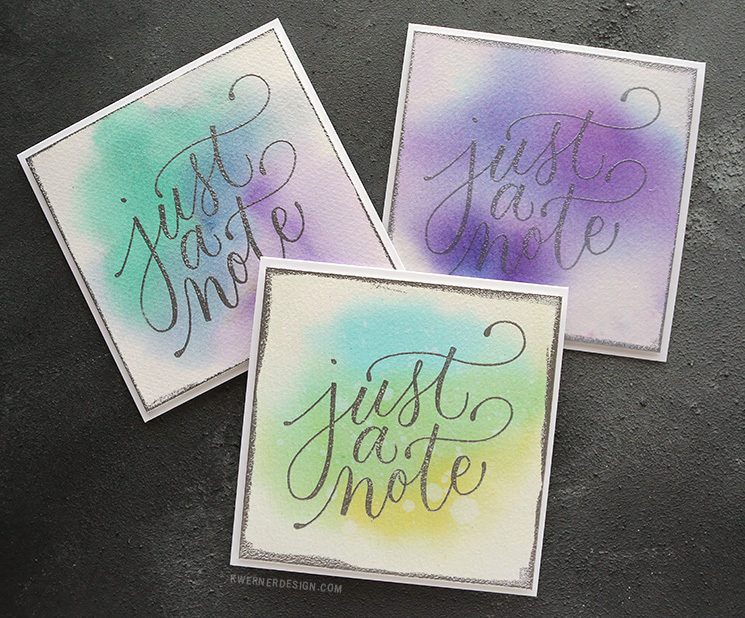 The first background was created using Nuvo Shimmer Powder in the color Violet Brocade. I loved how this color looked before and wanted to create with it again. The way the colors bloom on the paper is mesmerizing! The second background was created using mostly Mijello Mission Gold watercolors (with a bit of FineTec pearlescent watercolors but those didn’t show too much). The traditional watercolor approach worked great here. And the final background came about by using three different Distress Ink colors: Broken China, Cracked Pistachio, and Crushed Olive. I used Mama Elephant’s Just a Note stamp set to finish off all three backgrounds. I stamped the large greeting in VersaMark ink and applied Sterling embossing powder for a silver finish. NOTE: Since many of you asked about setting the Nuvo Shimmer Powder with Distress Micro Glaze, I tried it out on this background. 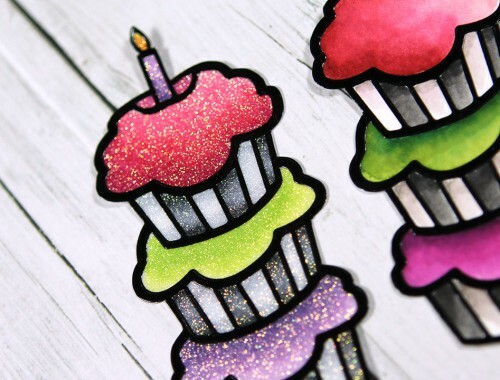 The Micro Glaze did seal the shimmer and color in, however I applied it over the top of the finished card which included Sterling embossing powder. Unfortunately, the Micro Glaze broke down the embossing powder! I was not anticipating this reaction. 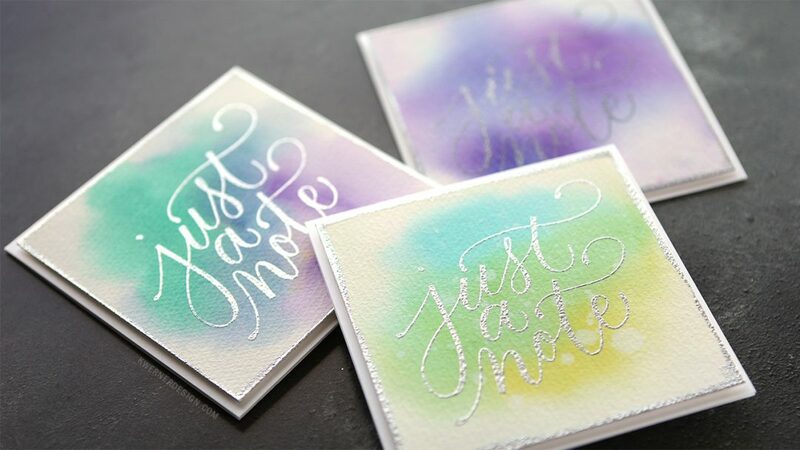 So, just be warned: Do not use Micro Glaze over the top of embossing powder. Anyhow, I hope you enjoy today’s cards and video. See you soon! I’ll be doing a Live Chat from Bermuda on Wednesday! Join me at YouTube at 7am MT (it will be 10am in Bermuda). Thanks for stopping by! 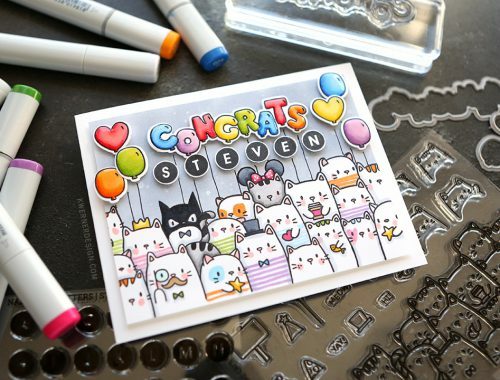 CATS, COPICS, & CONGRATS! Custom graduation card!